Juice Boxes With Realistic Fruit Skin Textures | OhGizmo! Now that I think of it, I haven’t had a juice box in years, but if I were to find one on a store shelf that was packaged like these, how could I pass it up? 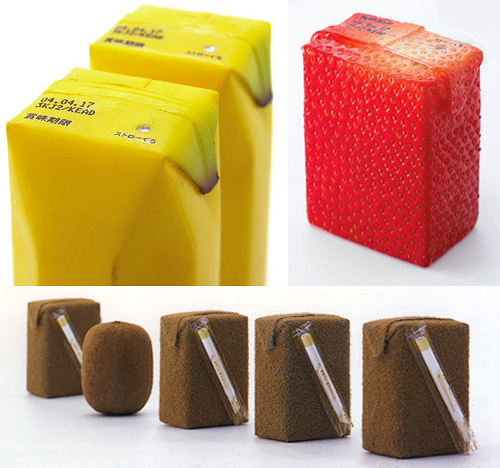 Created by Japanese industrial designer Naoto Fukasawa, the juice box’s packaging is supposed to be more appealing to the eye by imitating the actual fruit they contain. As Naoto puts it; “I imagined that if the surface of the package imitated the colour and texture of the fruit skin, then the object would reproduce the feeling of the real skin.” If anything, the novelty factor is through the roof, and on a side note, is there anything more refreshing than a box of banana juice? I don’t think so. It wouldn't be a nice idea to do this with pineapples. Plus, this type of packaging won't be cheap. Guess who's gonna be paying for it? juice box’s packaging is looking so beautiful that everyone would like to buy it! It's beautiful! Wow!Incredible!I guess I will only buy it for display and not for drinking purposes. Probably could design it so that it can serve some use to it? This is awesome. If this comes out in the market, it would be much better if the boxes are reusable. This is kinda creepy. I am not sure how i feel about this.